Easy Baked Penne – this easy pasta casserole is FULL of cheese! It’s accidentally vegetarian and no one will know it’s semi-homemade! Years ago I had a friend who introduced me to this easy baked pasta recipe. She made it for a 4th of July barbecue one time and we sat eating it for hours. I’ve been making it for potlucks and family dinners ever since. When I researched baked penne pasta recipes online before making it, I found that so many of them have meat in them. I thought that was strange, because I’ve only ever had THIS Baked Penne, which is vegetarian. My friend didn’t eat meat, so neither did her pasta recipe. As a result, I’ve always made this without meat. And you know what? I don’t miss the meat at all – plus I often serve it with a side of baked or grilled chicken or some meatballs for protein. After all, it makes a HUGE batch, so we’re often eating it at a potluck. The recipe is easy, using just a handful of ingredients, and comes together in minutes. 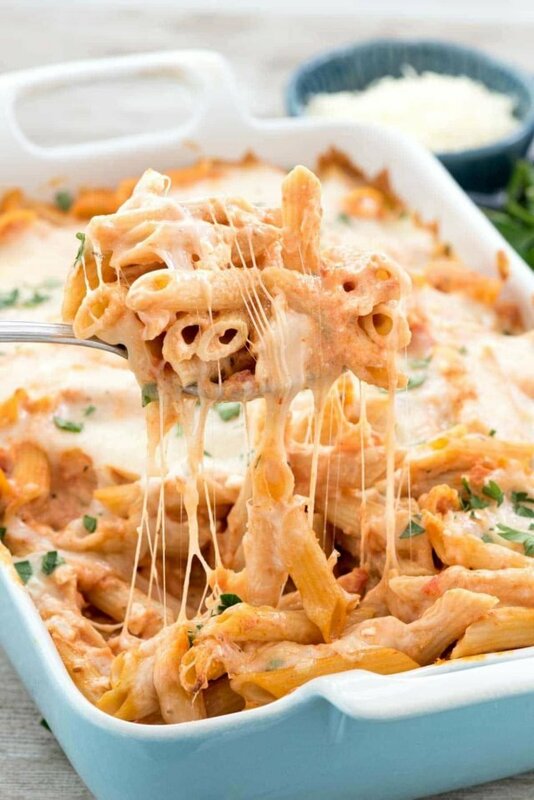 Plus, do you see how cheesy this baked penne is??? OMG. There are two secret ingredients in this baked penne pasta. Can you guess what they are? They’re two things I’d never seen in a pasta recipe before, but they make the end result so cheesy and creamy I just never leave them out. By the way, these two ingredients, if they weird you out, are two things I never eat alone. I ONLY use them in recipes, like Cheesy Egg Casserole. Wait for it…the secret ingredients are…. Sour Cream and Cottage Cheese. I KNOW! So weird in a baked pasta dish, right? BUT, hear me out. The cottage cheese adds body (and protein) to the dish. You don’t taste it at all, plus it makes it even more cheesy. There’s TONS of mozzarella to make you forget about the cottage cheese, but this dish wouldn’t be as good without it. 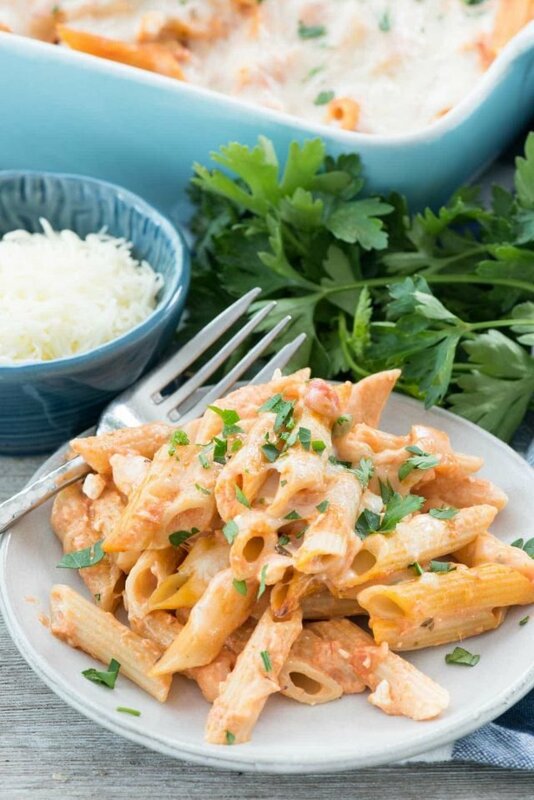 Sour cream adds so much creaminess to this easy baked penne recipe. This result is almost like a creamy tomato sauce. What other ingredients are there? Just pasta, pasta sauce, and garlic. You can use any jarred pasta sauce you like (I’ve used a variety of brands). OR, you can make your own red sauce. I love these recipes for easy homemade marinara sauce, this vodka sauce, and this spicy pomodoro sauce. I always kick it up by adding TONS (5 cloves) of pressed garlic. 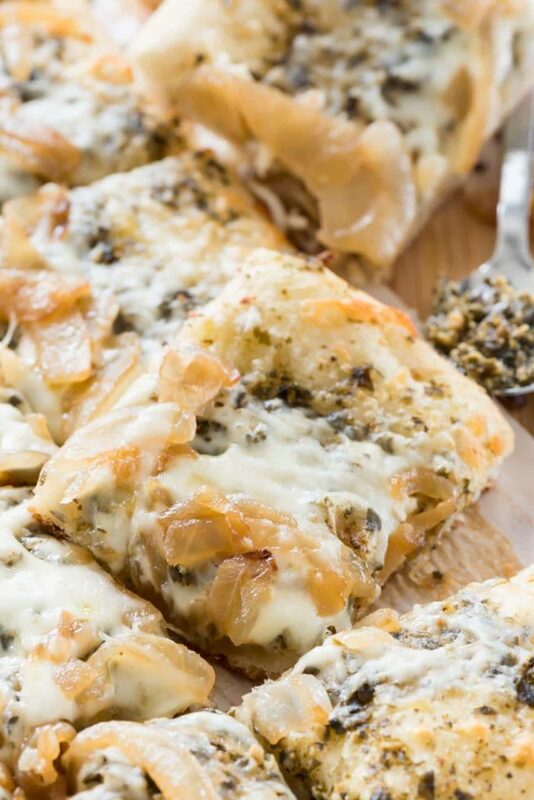 If you’re not a garlic lover, you can leave that out, but it gives a wonderful flavor to the dish. (Plus, it wards off vampires.) 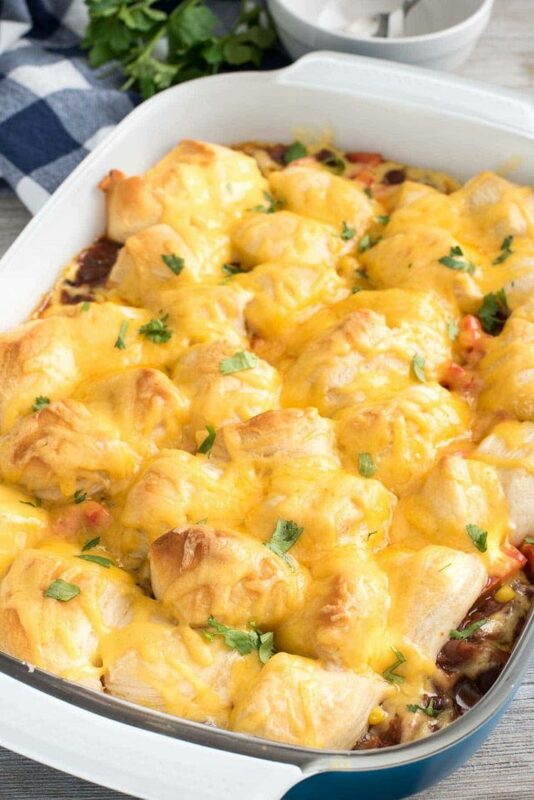 Then you add tons of cheese and bake it up. This dish is good from the oven, but I also eat it for days leftover, and I’ve even frozen leftovers. It feeds a lot of people so it’s perfect for a big family or a party. And you won’t miss the meat, although you can add some if you like (see note). Easy Baked Penne - this easy pasta casserole is FULL of cheese! It's accidentally vegetarian and no one will know it's semi-homemade! Cook pasta according to package directions then drain well. In a bowl or in the pasta pan, stir together pasta sauce, cottage cheese, sour cream, and garlic. Stir in pasta, then stir in 2 cups of shredded cheese. 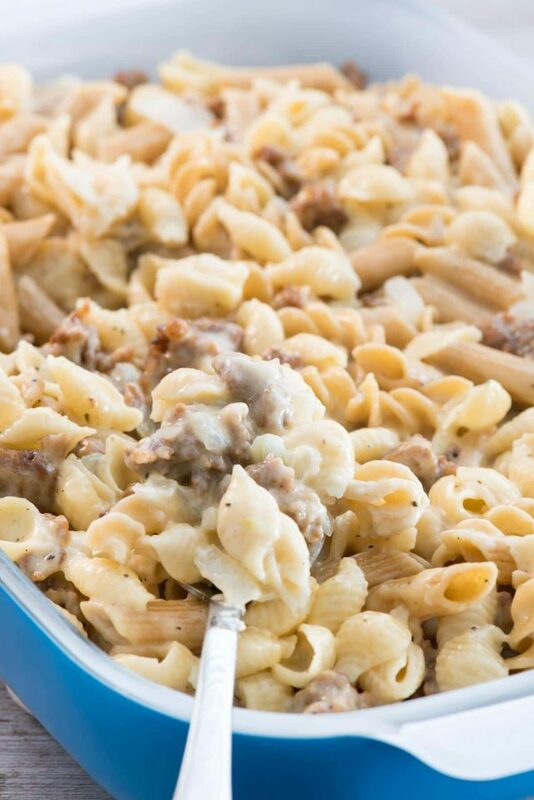 Spread pasta in a 9x13” baking dish. Sprinkle the remaining 2 cups cheese on top. Bake for 15-25 minutes or until the pasta is hot all the way through and cheese is melted. Serve hot. Store in an airtight container for up to 3 days. If you like this you’ll also like Buffalo Chicken Pasta Bake, Baked Pasta with Sausage, Mushroom, and Spinach, and Creamy Chicken and Vegetable Baked Pasta. Made this tonight and it was so so good! I did add some sautéed chicken and mushrooms just because I like to add that to pasta dishes. But I could totally see not adding it and it being just as amazing! Thank you for the recipe, will be making again!